Practitioners of the Keto Diet believe that one of the fastest ways to lose weight on the Keto Diet is by getting into ketosis quickly. On a low-carb, high-fat diet, your body is forced to switch from using carbohydrates (glucose) for energy to using ketones. When your body goes into Ketosis, your liver starts to produce ketones for energy from stored fats, which is often what triggers the weight loss in Keto Diet practitioners. Getting into ketosis can take time, but there are ways to help make it easier for beginner practitioners of the Keto Diet. 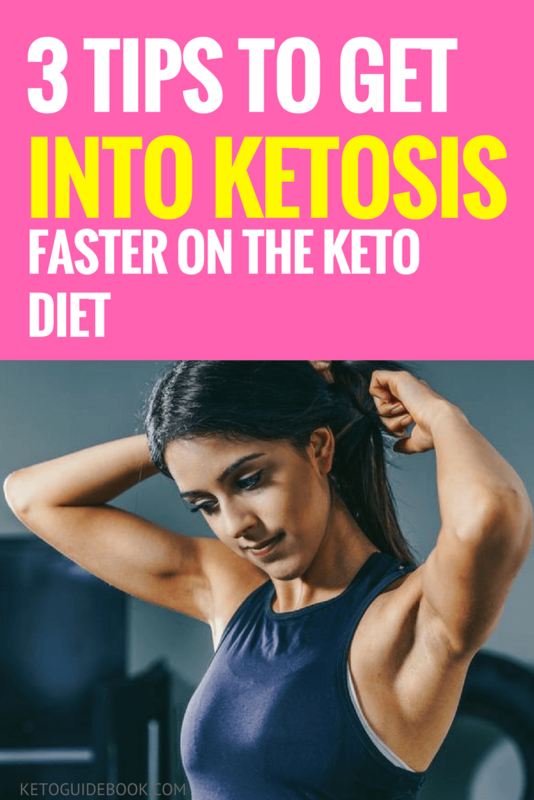 Here are 3 tips to help your body get into ketosis faster on the Keto Diet, which may be able to help you fast-track your weight loss and help you succeed with your new way of eating. Often, intermittent fasting goes hand in hand with the Keto Diet. When you forgo food for an extended period, your body can go into ketosis as it seeks out alternative energy sources to fuel the body. This can result in amplified fat-loss as it helps to eliminate glucose from the body. Fasting can also force your body to undergo a process called “autophagy” where your body devours old cells and uses the resulting energy to create new, healthier cells. With intermittent fasting, there are different ways to fast depending on how long practitioners wish to fast for, though many see benefits from fasting between 12 to 36 hours. Fasting may also help practitioners control their overall caloric intake. Many people find that when they only eat between a certain window of time, they are able to eat fewer calories on a regular basis, as they no longer find they are inclined to snack throughout the day. Fasting might not be for everyone, but it may help Keto Diet practitioners become fat adapted (where your body uses ketones from fat as its primary source of energy) faster. Exercise is another natural way to get your body into ketosis faster, especially when combined with a ketogenic diet. Exercise uses up glycogen stores in your body, which means your liver will be forced into producing ketones from fat cells in order to fuel your body, as long as you don’t eat an excessive amount of carbs after you exercise. By limiting your carb intake and exercising, you will kick-start your ketosis and help to ensure that your body is ready to convert fat into energy, instead of storing it as glucose, which turns to extra fat in excess quantities. Dieters who are looking to lose fat faster should try to incorporate exercise into their daily routine, and cardiovascular exercise often pairs well with a ketogenic diet. In addition, some practitioners find that pairing exercise with fasting (exercising on an empty stomach before a meal) helps increase their fat-loss by accelerating the rate at which the body produces ketones from fat cells. It is important to listen to your body and confirm with your doctor before starting any new fitness or diet routine, but exercising on the Keto Diet may be what you need to help your body become adapted to using fat as its primary source of energy. On the Keto Diet, it is considered important to ensure that the majority of your caloric intake comes from fat. This is hard for some beginners to get used to, as traditional diet wisdom has maintained that you should get the majority of your calories from carbohydrates. Do not be fooled. In excess quantities, your body converts carbs to glucose, which is stored as excess fat. Most adults aren’t getting enough exercise, which means not only are they often eating high-carb, high-calorie diets, but also that the extra food they are consuming is being stored as fat. On the Keto Diet, you can help your body manage itself better by being sure to eat a low-carb, high-fat diet, which will fuel your body without adding the extra pounds. When practicing the Keto Diet, be sure to inform your doctor or registered healthcare practitioner, especially if you have any health concerns when going on the diet. For many, getting into ketosis can be a challenge, especially at the begging states of the Keto Diet, but with these 3 tips to help your body get into ketosis faster with the Keto Diet, you can help get yourself into ketosis, which may help you lose those extra pounds.